Relax in style with our Maui luxury rentals. You can't beat the top-notch ocean views and amenities in our elegant and romantic penthouse and other Maalaea condos for rent. Complete with flat screen TVs, master bedroom suites, wine grotto and granite countertops you are sure to feel pampered! 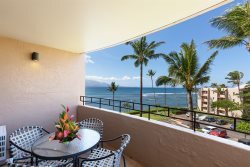 Relax on the private lanai, walk to the beach, and enjoy all the luxury amenities that will make your Maui vacation perfect. Contact I Go Maui today for additional information about our Maui luxury rentals.